Welcome to the “Beard for Bucks” team page sponsored by the Buffalo Police Benevolent Association. 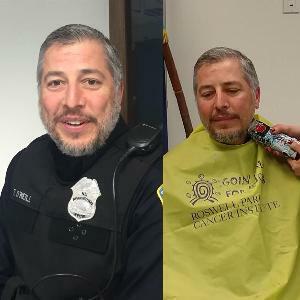 Members of the Buffalo Police Department wishing to participate in this year’s “Beards for Bucks” can do so by signing up and paying at the Buffalo Police Federal Credit Union. You can grow your beards, which must be neatly groomed as not to pose a safety hazard, from November 1st - December 28th for $100. Female officers can pain their nails pink during this time for a $50 donation. The PBA will match the donations of those participating up to $10,000. This year the sponsors of this event are allowing retirees, family members, friends and the public to join this fundraising affair. No donation is too small and every dollar raised gets us closer to a cure. Cancer is a disease that touches everyone and it will take a comprehensive effort to put an end to the suffering. Together we can find the cure and prevent loss of life, maybe even for someone you know.